Home / Match Report / City draw in Grand Final re-match! City draw in Grand Final re-match! Adelaide City share the points with Campbelltown City, with a 1-1 draw at Oakden in Round 5 of the National Premier League. Anthony Costa opened the scoring in fabulous fashion, with a thunderbolt into the back of the net, followed by Joseph Costa who doubled the advantage with another screamer. Campbelltown’s Alex Mullen pulled one back with a converted penalty. Adam Piscioneri then levelled the score-line in the 78th minute. Adelaide City started off the match well-structured and defended fiercely with great desperation to keep out Campbelltown. City moved the ball well up-field and it paid off in the 8th minute when A. Costa slithered into space around a pack of defenders to curl his strike into the top corner. In the 19th minute, Benny Kovadio was through on goal but an extra touch threw him off course and near the by-line. He passed onto Costa, but nothing came out of it. Costa doubled City’s lead with a thunderous shot, again into the top corner. As the second-half progressed, both sides had their fair share of chances, with Nicholas Bucco the closest in the 58th minute, as his effort was tapped over the bar by Nicholas Harpas. Campbelltown were awarded a penalty in the 63rd minute, in which Mullen tucked away despite Luke Ostbye’s touch. City had a few nervy moments as the visitors began to threaten and put the Black and White’s under the pump. Piscioneri equalised for Campbelltown after finding a great deal of space and finished into an open net to make it 2-2. City couldn’t find a special moment for the winner and the match ended in a share of the spoils. “Firstly, thanks to Joe Mullen and Campbelltown City for putting on a great spectacle tonight and I think it was an entertaining game for the neutrals,” he said. “From our point of view, I was very happy with the first half and we executed our game plan to a T as we dominated the ball, moved around well, created chances and scored two beautiful goals. “We knew that going into the second-half, Campbelltown would really come at us with pressure, they had nothing to lose. “Our main focus was to try and absorb pressure and play on the counter-attack, which I felt we did well because football is about being in control and you can be in control with the ball (in the first-half) and without (in the second). “It was up until that penalty, and the one little miss-kick, that cost us. 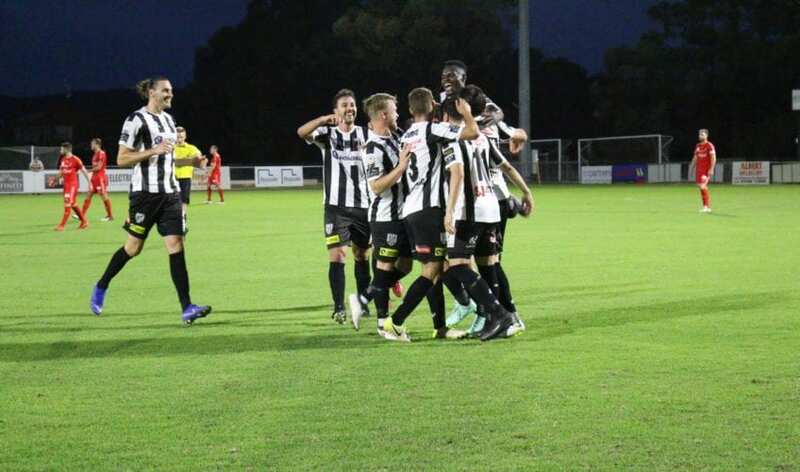 Adelaide City have a bye due to the FFA Cup round, in which they will take the opportunity to review the game and continue to improve as well as look at the positives. “Having the week off will help, and we’ll review the game and see the weakness that we need to improve on. “We do have some players that have a couple of niggles and it’ll be good for them to have more time to recover, and hopefully Marcos’ (Flores) injury isn’t too serious and he’s back for the next match. “The bye has come at a good time, we’ll prepare and rest off well and make sure that in the week leading in, we are focused on the few things that we need to improve on. Goal scorer, Anthony Costa reiterated his coach’s comments and said although it was disappointing, there are plenty of positives to take forward. “It’s hard to not feel disappointed with the result, especially being two goals up and that we couldn’t hold onto that lead,” he said. “There are still some real positives that we can take out of the game, especially the pretty strong first-half and we were able to score two good goals. “Now it is just about bringing that over to a consistent 90 minutes but there is always room for improvement and things that we can build on. “We still have a lot of new players, so looking forward it will be about developing our game style and we are getting better each week.